Kibbutz Be'eri was one of 11 settlements established in the Negev on Yom Kippur night, 6 October 1946, to protest the British Mandate's "White Paper" limiting Jewish immigration. The kibbutz was named after Berl Katznelson, one of the leaders of the labor movement. The original group of settlers numbered 20 or 30 men and women aged 18 to 20. 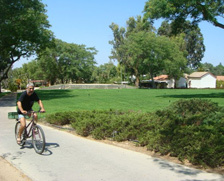 The kibbutz was first established at a site called Nachbir near the Gaza border. At the end of the War of Independence the kibbutz moved three miles east to an area with more arable land. The original concrete water tower and concrete building are still standing on the original site. In its early years the kibbutz economy was based on its members working outside the kibbutz. While some Be'eri members were employed at the Dead Sea Works in Sodom others worked in tree planting and road building throughout the country. At the same time, various agricultural branches were also established in the kibbutz: a dairy herd, orchards, and field crops. Be'eri Printers was established in 1950. With the years, the kibbutz has grown and has become a large cooperative community providing housing, education, health-care, and municipal services for 1,000 residents, of which 500 are kibbutz members.